The Art of Aikido is a way of being in the world. Put another way: Aikido is not something we practice a couple of times a week, it is the methodology we use to move into action during each moment of life. The simplicity of Aikido is breathtaking. On the mat we can see this simplicity when nage draws uke's energy and attack seamlessly into a fluid, effortless throw. There is no technique, just the act of merging with the mind, body, and energy of the attacker, in real time, to execute the throw. A few years ago, at a seminar in Lake Tahoe, I saw demonstrated a continuous awase having the sole purpose of perpetually finding this effortless blend. Two senseis, Aviv Goldsmith and Patrick Cassidy, were moving at close quarters into each other's center with the jo. It was like push-hands in Tai Chi. Within the movement one would capture the center, then the other would absorb and move off the line finding an opening to move in and reciprocate the capture. It was all being invented in real time without a script, completely arising out of the fluidity of being and becoming. I watched this spontaneous awase and marvelled at the beauty and simplicity of the whole, as it unfolded from the individual movements of the two partners. 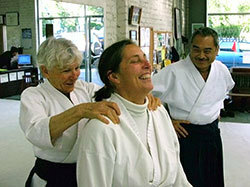 Off the mat it is more of a challenge to see the simplicity of Aikido as it arises in daily life. It may involve noticing the fear or despair underlying someone's angry outburst; clearly something the antagonist cares about is threatened: what is it? Having the largeness and presence of mind to attend to this inquiry is the first step to seeing an Aiki pathway to resolution. Terry Dobson's train story is one account of an old man exemplifying such a way of being. More than anything Aikido is about connecting with people powerfully, meeting them with full awareness and commitment to what they care about. This requires an expansive mind, one that not only ranges far beyond our own agendas and desires, but that includes the concerns of others and an understanding of why these concerns are important to them. If, to further these concerns, uke needs to make a shift in his or her way of being, well, that's part of what taking ukemi can teach them. People carry their lives and concerns in their bodies. We learn this first through the physical contact we make with them in training. But then after a while we are able to perceive the mind of the other without touching, but simply through sensing their way of being present in their bodies. To understand and hold, as we move into action, what uke cares about; to physically and energetically blend with these concerns without making them wrong; and to guide the exchange to an unexpected new arising of harmony, is to be in the world in an Aiki way. A way to improve our Aikido on the mat is to consciously enliven these ideals in every aspect of our physical practice. We know when a technique klunks or when we collide with uke's energy, or use force to get out of a jam. When this happens we have failed to connect. Recognizing this and slowing down to keep the connection alive is how we make progress. In life on and off the mat the skill of expanding mind to include the concerns of others is the same practice. It requires the willful quieting of our own mental chatter and release of selfish attachments so that the clarity of mind we need to begin to notice the concerns of others can arise. If we cannot quiet our own chatter we will never be able to expand our minds enough to be able to adope an Aiki way of being. This takes practice, and no mere reading of words can foster this skill. If we meet failure in this then we can practice directing the compassion we want to employ with others, on these occasions with ourselves. Each moment we are in the world provides us an opportunity to practice Aikido as a way of being, not just as a way of thinking or acting. If we miss opportunities due to our own obtuseness, there is cheer in the realization that as every new moment arises so also arise new opportunities. Both are very good arts. Hapkido is basically Aikido blenedd with TaeKwonDo. For a street fight, I would definitely say Hapkido. I've taken Aikido off and on for a couple of years, it's a very deep art, but takes a long time to get to a point of using it in a real life situation. That said, a black belt in Aikido is a very formidable foe.Aikido and Hapkido both take a lot of time and effort to get to the black belt level. It totally depends on the instructor and school, but most Aikido schools I've been with take at least 5-6 yrs of training to achieve a black belt.Steven Seagal is a very high ranking Aikido master. Not sure of any Hapkido stars in the movies.